Limited time sale. Save 40%. ♦ Tired of cold calling? ♦ Competing with others for the same leads? ♦ Want your phone to ring more with people who want to buy a home? *** No cold calling with this. These are warm leads. HOW DO YOU GET MORE LEADS WITHOUT SPENDING THOUSANDS ON ZILLOW LEADS or purchasing other leads? Are you scratching your head, wondering how oh how can you have buyers calling YOU? How in the world can you get more leads and NOT pay Zillow an arm and a leg? Are you tired of not having enough leads? Or no leads at all? I get it! I was there too! It's not a fun place to be. I was stressed. My phone was silent, email was silent. I need to earn income! What in the heck am I going to do? When I first started I thought…okay, I have my license, I know a lot of people but everyone is settled in, has homes. Homes are not something people buy and sell daily. So what in the heck am I going to do? I searched, studied, looked around at what others were doing…searched more. I called expireds. I called FSBOS. I created postcards and went door knocking. My sphere sent me some leads (and that was fantastic) but it wasn't consistent income. I searched, tried different marketing techniques…and then I stumbled upon THIS! Huh, what is this? This seems to make sense…alright, hmmm, I'll try it. I'm glad I did. Once I figured it out, tweaked and tested how to market these…I had PLENTY OF LEADS and was getting one closing a month from this. What did I do? This little known way is something you can do and not many people know about it. It has to do with creating ‘inventory' for yourself. Inventory you ask? Yes, listing agents have plenty of business because they have inventory…HOMES TO MARKET AND OBTAIN BUYER'S LEADS. This was a way for me to have ‘inventory!' WHAT DID I DO? I FIGURED OUT HOW TO EFFECTIVELY AND STRATEGICALLY MARKET HUD Homes so I'd have buyers CALLING AND TEXTING ME and I created a pipeline of leads. Which brings up another income generating point…You can STRATEGICALLY market these properties, get leads from this technique and refer the leads to other agents for a referral fee. It's another income generating technique…particularly if you want to generate leads in areas that have quite a few HUD properties but may not be near you. Well, it took me a while to figure it all out. I had to figure out what to say in my marketing. I had to figure out what all the regulations are so I don't get into trouble. I had to figure out how to convert those people calling me into my own clients. I tested and tweaked, tested again and tweaked again to see what worked…and guess what? I started getting leads and converted some buyers to closings within 6 weeks! *That's not the case every time but if someone is motivated to purchase and you take care of them (and they qualify for a loan) this can be done quickly!…BUT YOU NEED MOTIVATED LEADS. I created this step-by-step course below so you can start immediately and won't spend all the crazy amount of time I did figuring it out. You eliminate the learning curve and expenses I went through when I had to figure it out. Here I show you exactly what I did. Not only do I show you how to find and strategically market these HUD homes but I also walk you through converting leads to sales, how to create calls to action and how to engage with these leads so you turn them into customers! THIS WILL PAY YOU BACK IN SPADES. I've made hundreds of thousands of dollars in commissions as a result of doing this. I’m still making money from this technique from work I did years ago. 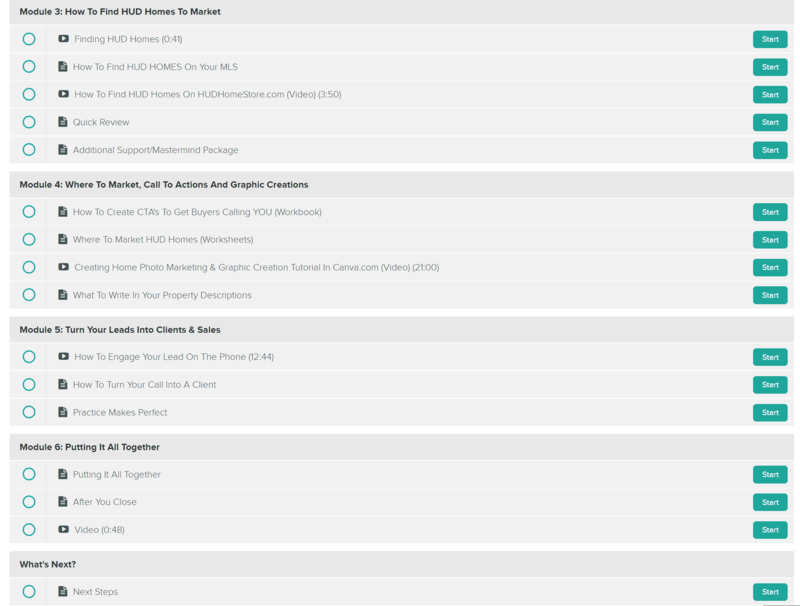 In the last 2 months I’ve made $16,000 in commissions from repeat clients and referrals. As I was creating this for you I said to myself “I sure wish I had this when I learned about it and was trying to figure it out!” It would have saved me sooooo much time and effort! And time is money. I designed this specifically so you Learn It Quickly, Get Started Immediately and Start Generating Leads NOW. These walk you how to create your inventory. They also take you step by step on how to find, market and engage the leads when they come in. No need to wonder about how to create captivating marketing materials…I take you step by step. I also take you step by step on what to say when a lead calls you. You can apply this to all areas of your real estate business! These workbooks are designed so you may customize the information SPECIFIC TO YOU. Personalize away! Easy reference you can print and keep by your side. I've built a country wide award winning business and I did this using the sales and marketing techniques I show you in this. You can apply these techniques to all aspects of your business. Step by step workbook showing you how to turn your wildly important goals into reality. This is based on research and thousands of case studies and my personal experience. This workbook is life changing…use it and you'll see your goals turning into REALITY. Easy Payment Options For You. PayPal and all Credit Cards accepted. For the price of a couple of dinners…this will provide for you for a lifetime. ♦ You receive the entire system that shows you exactly how to find and market HUD properties to get buyers contacting you AND HOW TO CONVERT THEM TO CLIENTS. ♦ Self-paced text and video instruction. Built in progress tracker so you can easily find where you left off!